Our 3rd annual 'Get to the Point' challenge ride on Easter Monday had four teams in fierce competition, vying for ascendancy by dashing across Brisbane to points in three different directions. The big points on offer for getting to the top of the infamous Goat Track attracted two of the teams with one team choosing the flat track speed of Redcliffe Jetty and the remaining team linking Mt Gravatt and Victoria Point. In the end it was the dazzling ladies of the 'Point-er Sisters' (Caroline J, Gabrielle T, Anne Louise C, Loralie L) who took the win on highest points after shrugging off a flat tyre on the Goat Track. Their club kit was set off nicely by the feather boas and headpieces, setting a not-to-be-repeated style as they took out 'best photo' points. Yes, they rode the entire distance laced with feathers! 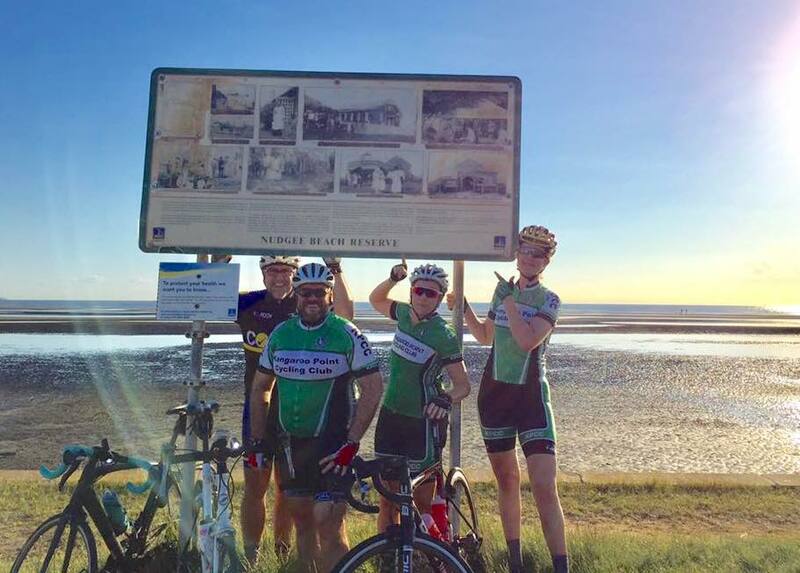 - Team #3 (Liam, Andy V, Tom, Matt A) not only powered to the top of the Goat Track, Mt Nebo and Mt Coot-tha but also covered lots of territory in an attempt to fit in Mt Gravatt before wisely aborting to get back to the finish line just 2 minutes over the time limit. This effort sealed a 2nd place for the day. - Team #2 (Richard, Annie, Wil, Roy) came in 3rd place with their Mt Gravatt and Victoria Point combination but overcame some adversity in the form of a broken front wheel spoke on Wil T's bike. The story is that Roy gave a quick lesson with the spoke tool and fly-weigh Annie swapped the damaged wheel onto her bike for the remaining 70km so as to reduce the chance of further failure. - Beauties and the Beasts (Jacinta, Lucy, Shane & Troy) did the Nudgee Beach, Redcliffe Jetty double and were the first team to crawl over the finish line (3 hr 42 min) at MySweetopia with plenty of huffing and puffing but with the biggest smiles of all. Congratulations to everybody involved and we look forward to the 2018 edition in which the handicapper's pen will have made some adjustments to the team member weightings. We will also add some extra elements and variety to the points that can be achieved. The fun factor will go to another level again.